The summer movie season is officially in swing once again, but sadly, Hollywood’s “Big Six” studios haven’t really turned out much about which audiences can be excited. That leaves one wondering what alternatives are available. One answer comes in the form of Shout! Factory’s recent re-issue of the classic dramedy Car Wash. Released June 20 on Blu-ray, this 1976 flick is the polar opposite of everything in theaters today and almost everything before with few exceptions. That is due in part to the movie’s story, one of its key elements to examine. It will be discussed shortly. The movie’s soundtrack is just as important to note believe it or not. It will be discussed later. The soundtrack is discussed at more length in the movie’s bonus material, which in itself is important to note. Each element noted here is important in its own right to the whole of Car Wash’s presentation in its recent re-issue. All things considered, Shout! Factory’s recent re-issue of Car Wash is a solid alternative to Hollywood’s annual lack of summer entertainment. Shout! Factory’s recent re-issue of Universal Pictures’ classic dramedy Car Wash is an enjoyable alternative to Hollywood’s annual lack of entertaining summer fare. That is due in part to the story at the center of the movie. The story is relatively simple. It follows a group of car wash employees over the course of a single day on the job. It sounds simple, and it is. But it’s that simplicity that makes the story so interesting even with all of the different story lines. Far too often in today’s movies, multiple story lines are the norm, and far too often, those multiple story lines mess up said movies because said movies’ writers don’t know how to balance the stories. That wasn’t the case here. Script writer Joel Schumacher (yes, the same one responsible for those awful Batman movies) actually did an applause worthy job in balancing each character’s story within the bigger picture of the story’s script. That ability to balance the stories ensures audiences engagement from beginning to end. On another level, the story’s aesthetic elements add even more to its surprising enjoyment. It balances just as well its dramatic elements and its more comedic moments, making the story even more entertaining. Viewers will laugh as one of the guys stuffs his friend’s sandwich with hot peppers and as George Carlin’s taxi driver looks for a woman who tried to get a free ride in his cab, trying to get his money. What’s interesting about his performance is that one can’t help but wonder if Bill Murray might have taken Carlin’s performance as inspiration for his performance in Caddyshack. Putting the pair’s performances side by side, one can’t ignore the similarity in the characters’ portrayals. Getting back on track, audiences will be just as entertained in the story’s more moving moments such as when T.C. tries to woo a certain young lady and when Duane tries to rob the car wash (not to give away too much). Between these moments and so many more, the balance of the story’s humorous and heartfelt elements makes the story even more entertaining. Doing a comparison to certain other movies, one can’t help but compare that balance to that presented in Friday. Stylistically, the two stories are very similar in that aspect. Keeping that in mind, it shows potentially the long reach that this story has had. Considering that and the balance in the story’s multiple lines, it becomes clear why Car Wash’s story is central to its presentation in more ways than one. It is of course just one of the movie’s important elements. Its soundtrack is an important element to note, too. The story at the center of Car Wash is central to its presentation not just because it is the story, but because of the balance in its multiple arcs and aesthetic elements. That balance ensures audiences’ engagement throughout the course of the classic dramedy. Even with this in mind, it is not the movie’s only important element. The movie’s soundtrack is just as important to note. That’s because it isn’t just a random soundtrack. In fact, as is discussed in the bonus material, it is actually its own part of the movie. As is noted, the movie is actually built around its soundtrack. The songs are deliberately placed alongside each scene in order to heighten each scene’s appropriate emotion. Such a practice is something rare nowadays in most films. It shows, too, with so many soundtracks just overflowing with Top 40 and rock songs. Given, the songs included in this movie are major radio hits to this day. But they were strategically placed, and quite well at that. Even more interesting to note is that the movie’s title song was released before the movie even hit theaters. That, too is noted in the movie’s bonus material, which will be discussed shortly. Considering the deliberate, well thought out placement of the movie’s soundtrack, it goes a long way toward adding to the movie’s entertainment especially taking into account the knowledge of that intentional placement. Keeping this in mind, it becomes fully clear why the soundtrack around which Car Wash’s story is built is just as important as the movie’s story. It is not the last of the movie’s important elements either. Those previously noted bonus materials round out the movie’s most important elements in its recent re-issue. 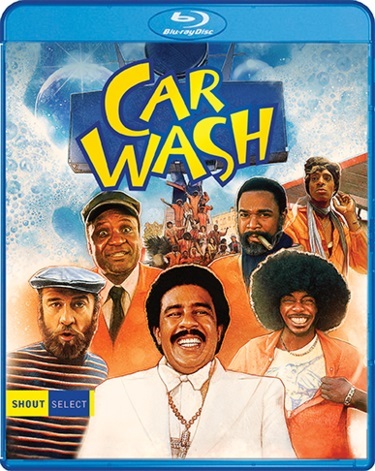 The bonus material included in Car Wash’s recent Blu-ray re-issue via Shout! Factory are important to the movie’s presentation because they, surprisingly, create the movie’s backbone. It is through Producer Gary Stromberg’s discussions that audiences learn about the movie’s story being created around its soundtrack rather than the other way around. His discussion also reveals the tidbit about the movie’s title song being released to radio in order to build excitement about the movie. Audiences will be surprised to learn just how much excitement that approach built. For those unfamiliar with the song, the discussion on the song along provides an interesting history behind the composition. As if that isn’t enough, Stromberg reveals he was still a struggling college student when the idea for Car Wash came about. Audiences will be surprised to learn this piece of history, considering how popular the movie has gone on to become in the now almost 41 years since it debuted—on Oct. 22, 1976. Stromberg’s discussions on the Soul train dancers being hired to dance at the movie’s premiere, how the story was scripted, and more are just as enlightening as his other discussions, too. Considering all of this, Stromberg’s overall discussions form a solid foundation for Car Wash in its recent re-issue. Looking back in hindsight, it is recommended that audiences watch this discussion before taking in the movie because of the groundwork that it lays. Stromberg’s thoughts are not the only important input presented through the movie’s bonus material in its recent re-issue. Schumacher’s own commentary throughout the movie offers its own interest. That will be left for audiences to discover for themselves. His commentary, when coupled with that of Stromberg, creates a solid foundation for Car Wash proving finally just how important the movie’s bonus material is to its whole. Keeping this in mind, the movie’s bonus material proves to be just as important to its presentation as its soundtrack and story in making it entertaining in its recent re-issue. Keeping all of this in mind, the movie in whole proves to be, again, a solid alternative to anything that Hollywood’s current lack of worthwhile entertainment. This entry was posted in DvD's and blu-rays, Internet, Movies and tagged Bill Murray, Caddyshack, Car Wash, celebrities, entertainment, facebook, Gary Strombach, George Carlin, internet, Joel Schumacher, movies, Phil's Picks, Shout! Factory, Twitter, Universal Pictures, Wordpress by philspicks. Bookmark the permalink.